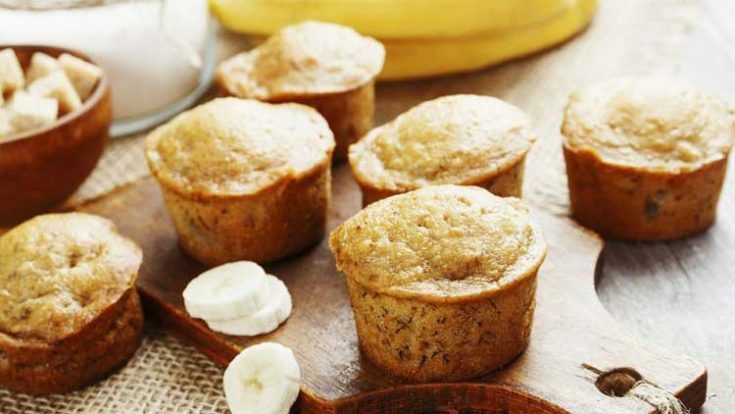 Looking for the perfect banana muffins recipe? If you’re bananas for bananas, you’ve landed on the right page. 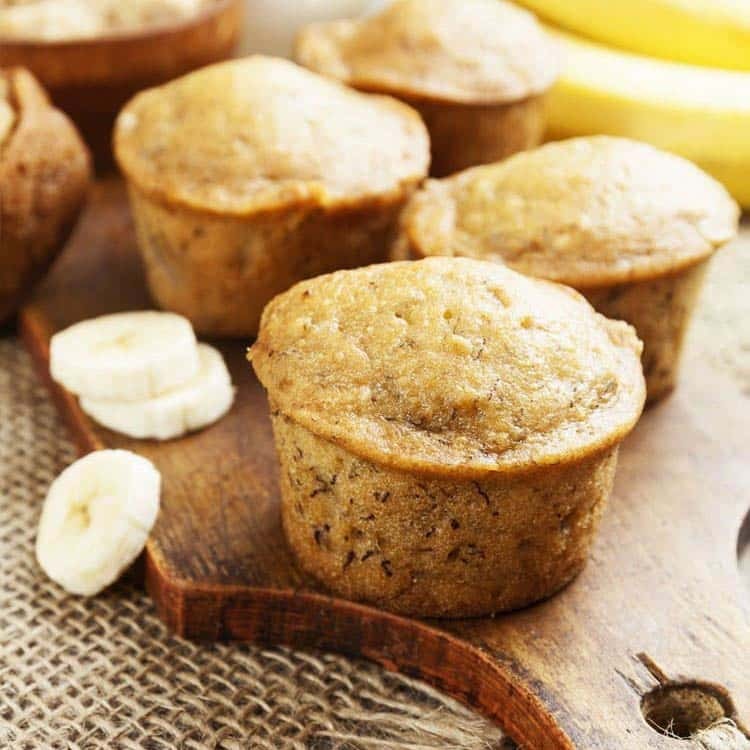 Because, whether you’re looking for something like our Perfect Banana muffins (which you obviously are), or something more along the lines of a banana smoothie–which is healthy and absolutely to die for–we’ve got you covered. Heck, you might even want to dive into one of our chocolate peanut butter banana smoothies while you’re here. Muffins are one of the easiest things to bake. And if you think all those store bought muffins that look absolutely gorgeous are complicated or beyond your skill level, think again. Give yourself a reassuring pat on the back and take a look at what we’ve done with our Chocolate Chocolate Chip Banana Nut Muffins. It’s really quite simple. All you have to do is sprinkle a delightful topping over the batter before you put it in the oven to bake. Chocolate chips, chopped nuts, dates, a streusel topping–whatever you like. If your muffin recipe doesn’t specify a topping, be creative. For example, with this banana muffin recipe, I’ve often used chopped nuts and chocolate chips as a topping and I have to say it is absolutely DE.licious! I love the idea of making muffins out of bread recipes, which is exactly what I’ll be trying out with several of the recipes I found in The Hot Bread Kitchen Cookbook. Which is an amazing cookbook, by the way. And as for that Perfect Banana Muffin recipe–not to brag, but you’ve found one! I woke up a good hour early this morning, checking to see if the kids would have a two-hour delay or no school because of the impending snow storm we had expected last night. When I looked out the window, it was easy to see the snow hadn’t even started yet. I don’t know about you, but I was always excited to have a snow day. Needless to say, there was disappointment in our house this morning that it hadn’t snowed! I did briefly considered making Pumpkin Chocolate Chip Muffins, but didn’t have any pumpkin thawed. With that off the table, there was nothing left to think about than the world best banana bread recipe. I have seen about a gazillion recipes for banana bread muffins, but I happen to love this easy recipe that we make at our house. The great thing about this recipe is that it is super easy to dress up with add-ins like chocolate chips, walnuts, or a little streusel topping. So… ready, set–let’s make easy banana bread! What’s even better? It is kid approved even without all the extras! 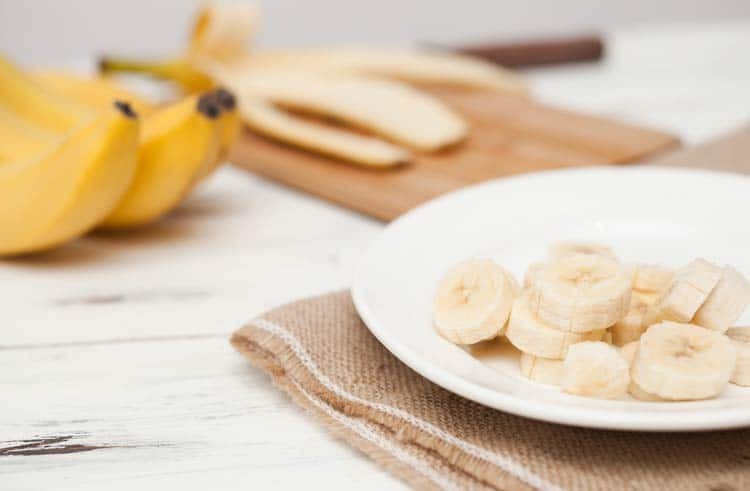 So, use up those mushy bananas and try this for breakfast, or an anytime of day snack! If you haven’t tried to make banana muffins with your kids, you should. A kids baking set really a lot of fun–it is a real baking kit that is made for kids. Line your muffin pans with fun muffin pan liners. At All She Cooks, we LOVE fun and decorative muffin pan liners because they are a great way to make less mess and be fun and festive in the kitchen while baking. Sure, you can buy the standard muffin liners in the stores, but there is a much better selection online. Mush up bananas in a plastic bag. It makes the job less messy and it’s just fun to squeeze the bag of bananas and mash them all up. I know… kinda silly, but it really is fun. Especially for kids in the kitchen. Mix the wet ingredients all together. Add dry ingredients and stir together until just mixed. No need to over-mix… just get out any lumps. Spray a your favorite muffin tin with cooking spray and then divide batter evenly. Recipe makes enough for a dozen regular size muffins. Bake these delicious muffins for 18-20 minutes on 350 and then they are ready to be eaten up. This is my family’s favorite go-to muffin recipe and they don’t last long at all. Banana muffins are kind of like buttermilk biscuits with strawberry jam to me. These muffins are so moist and delicious it’s hard to stop at just one. 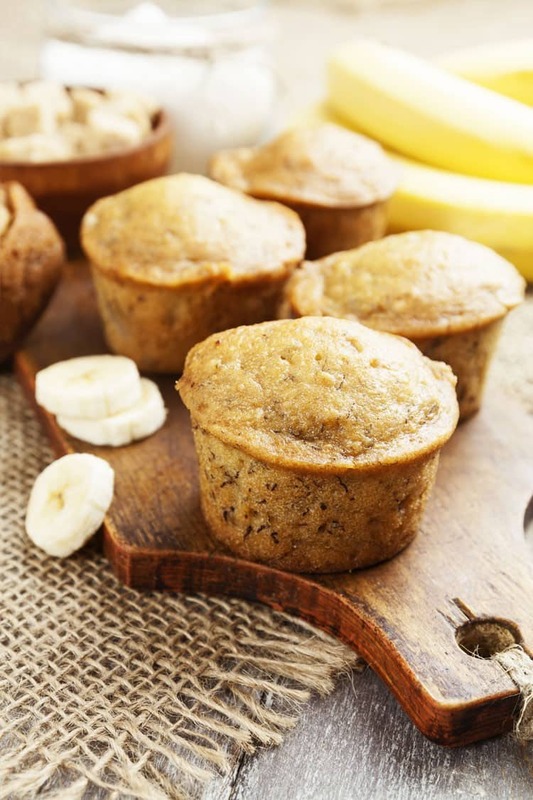 Perfect Banana Muffins are easy to make, wholesome and the perfect way to start any morning. They're so good you'll be making them again and again. just made these this afternoon. i used a mini muffin pan – 15 minutes in 350 degree oven. so delicious! perfect mini bites. Sounds like a wonderful bite! So glad that you enjoyed them. Thanks for sharing your time for the mini-muffin version. @Toni, Thank You! for that extra note re: minis. I’m going to bake these for our church Men’s Breakfast and I didn’t want to make full size. I also just made these in a mini muffin pan for an easy snack for my 2 year old’s little paws, SO good, she has already eaten three of them 🙂 I also added 1 tbsp of ground flaxseed to add some extra goodness for her. Delish recipe ! Great idea for a healthy addition! So glad you liked them. I think I need to make some more for my kiddos with all these nice comments coming in. These are fabulous! They are moist and delicious and they look beautiful. A little bit of cream cheese frosting would put them over the top. I want to try adding choc chips, walnuts, and maybe something healthy, like wheat germ or ground flax seed. I’ll absolutely make them again the way the recipe is written, but it will be fun to change it up sometimes, too. Thanks!! Thanks Anne! I’m so glad you liked them and cream cheese frosting sounds like it would be delicious. I’ll have to try that sometime. Thanks for coming back to let us know how it turned out for you. I was looking for a good banana recipe a couple days ago, for some ripe bananas I had around. Found this and it was an instant hit. The whole family loved them. So much a matter of fact I have a second batch in the oven. I thought they were very moist and stayed so. They were also great warmed or at room temp. Thanks for sharing this. Perfect! I love hearing success stories. 😉 So glad that your family enjoyed these muffins so much. Thanks for returning to comment! I just made these muffins! They were delicious! I substituted for a healthier muffin: soy milk, egg whites, and splenda. Turned out great! I found your recipe on Pinterest and have made it many times and its always great. I love that they are so moist and don’t dry out. I’ve added chocolate and peanut butter chips before and they always gone within two days! They are so good! I’d love to blog about it as well! These look delicious. Thanks for sharing on Foodie Friends Friday! Just made these with some aging bananas for my cooking class. My students loved them. I made these today and my kids loved them! I made mini muffins instead of regular size and I love that they aren’t messy at all! just made these for a second time. great recipe. I substituted unsweetened almond vanilla milk. I used unsalted butter as I do when ever I bake. They last for about a half an hour the family gobbles them up. Thanks for sharing. These look fantastic! Love banana muffins and breads. I also did these as mini-muffins. I got about 40 minis (a pan of 24, one of 12, and 6 more). Took about 15 minutes in a 350 oven (I set the timer at 13 min and checked with a toothpick). Very yummy and kid approved! I did also reduce both the sugar and salt – cut the salt in half and used about 1/8 cup less of the white sugar than the recipe called for. Very moist and delicious! I will definitely be trying these again (and I will try reducing the sugar even more). Definitely a keeper! Am I blind because I don’t see the recipes here? I apologize, I found it after a little more hunting. I hope mine are as good as the rests are. I’m patiently awaiting my loaf to be finished. This recipe is quick & easy to follow! Not sure how long the loaf will need to cook but I’ll be checking after 40 minutes. I made these muffins this morning, following the recipe just as written. They were moist, packed with banana flavor and downright DELICIOUS!! 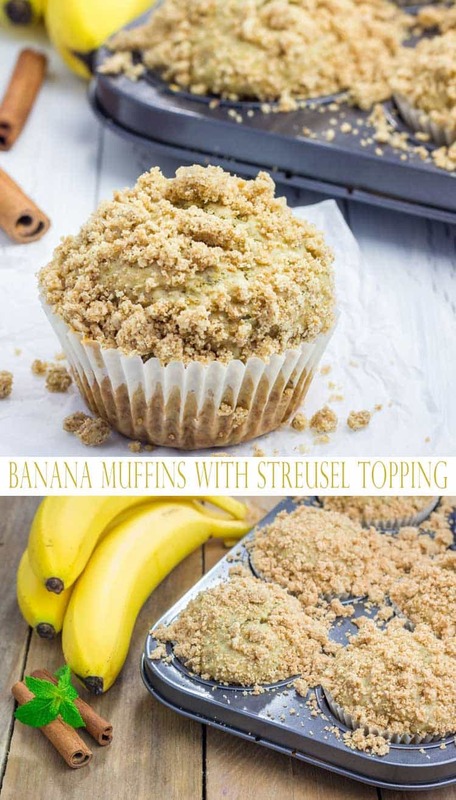 Next time I’m going to try a streusel topping just to dress them up for company. But either way…THANK YOU for sharing. You’re so welcome! The do get rave reviews all the time. 😉 Glad you enjoyed! These are so good! I doubled the recipe and got 26 out of them. I just baked the last two in baking cups on a pice of folded tin foil, so I wouldn’t have to wash my muffin pans twice. I didn’t change a thing, and I’m at high altitude (Denver), and these worked great. I found them on Pinterest, and thought I’d try a new recipe for my dying bananas! Thank you for a keeper! Glad you enjoyed them. We still make these all the time. Hi, I have made these before and thought they were awesome! I’ve come back to make them again, but I don’t see the recipe. Am I missing something? Ingredients are listed at the bottom with the recipe. There was a plugin error that has been corrected. Sorry! I don’t see the recipe ? Could you add the ingredients to the text so we don’t have to watch the video please?